The Gleaning Project of South Central PA began as the Adams County Gleaning Network. It was started by Jan and Jerry Althoff, an Adams County couple who wanted to do mission work locally in Adams County. They heard about food insecurity and received a post card about gleaning and took the step to build a local coalition. Gleaning is when a farmer allows others to take what remains after the harvest – to glean the remnants of their fields. Adams and Franklin Counties are highly agricultural communities. Jan and Jerry began working with local producers to collect their left-over produce and bring it to South Central Community Action Programs (SCCAP) and other local food-relief entities. As the program grew, Jan and Jerry could no longer coordinate the program so they came to SCCAP for help. Gleaning provided more than 60,000 pounds of produce. Given the program’s importance to the local community, SCCAP adopted the program, and The Gleaning Project of South Central PA (TGP) was born. Now in its second full year, The Gleaning Project has exploded. TGP has seen an increase in the amount of produce collected, communities served, number of producer partnerships, number of organizations receiving produce, and the additional services provided. 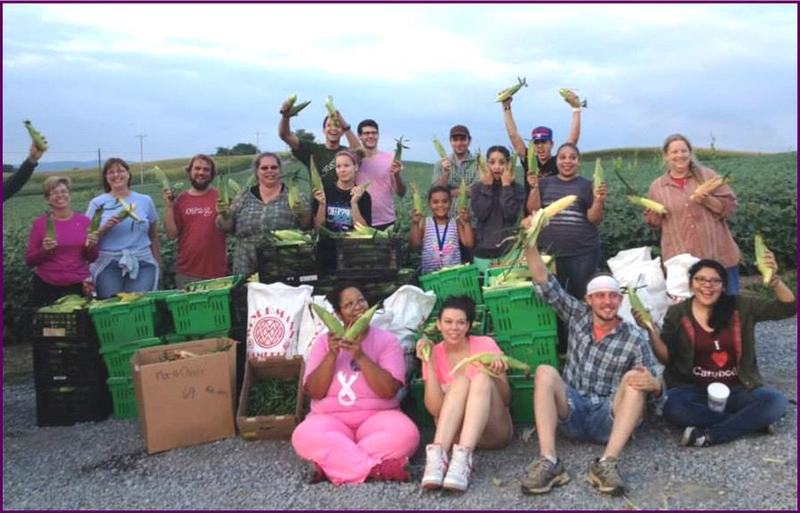 In 2015, The Gleaning Project, with assistance from Summit Health, a CSBG Discretionary Grant, and Adams and Franklin County Government, expanded in Adams County and Franklin Counties. To-date, the Gleaning Project, with support from more than 500 volunteers, rescued nearly 304,000 pounds of fresh produce from more than 80 local producers and farmers. Volunteers have distributed produce to more than 40 local organizations to assist thousands of local residents. Nearly 9,000 unique individuals were served at SCCAP alone. On top of picking, sorting, and delivering produce, volunteers, including many low-income families, hosted canning, preserving, and cooking classes. On top of the very tangible results of 304,000 pounds of healthy beautiful produce reaching food insecure individuals, SCCAP has started important discussions in its community around food insecurity and hunger. They have hosted community movies such as Fresh and A Place at the Table, held forums where families shared their stories, and spoken at community events and churches. It has sparked partnerships across agencies, the health care system, local farmers, and producers (some of whom plant an additional row to provide additional produce for families). In programs such as Support Circles, SCCAP has seen the intangible benefit when families volunteer together. For example, knowing where produce originates, charitable giving, and heathy eating have all contributed to very positive outcomes. The Gleaning Project has significantly reduced hunger during the growing season. TGP provides healthy, nutritionally dense foods, that reduce health risks and obesity. A community dialogue that encourages a wide range of service providers, the agricultural community, and the health community now exists. The Gleaning Project and its partners have improved the health and welfare of low-income families and seniors all across their communities!